Hello from your local Hunter Valley Web Designer. Yep! You read right… Rosetta chose to close down her website developed by Natalie Crowe Designs…. So what on earth am I doing writing about it here????!! and WHY would I want to write a whole blog post about a client deciding not to use a website designed and built for her?? Well this blog post is about Rosetta’s experience. I have Rosetta’s permission to share our web development story and how our business journey has come about. Rosetta contacted me some time ago … 16 maybe 18 months ago looking to setup a website. She was a little apprehensive with the process and wasn’t sure exactly what she wanted or what she wanted to with her new website but she knew she needed to have a website. We got her started with a basic site and setup the content for her based on her ideas and content provision. I themed the site much like a resort theme with “hot stones” as a part of an unofficial logo and make the site look as fresh and clean and appealing to Rosetta’s ideal target market – at that point – her target market was clients who were interested in getting mobile massage schedule, sometimes for parties and events or corporate gigs. 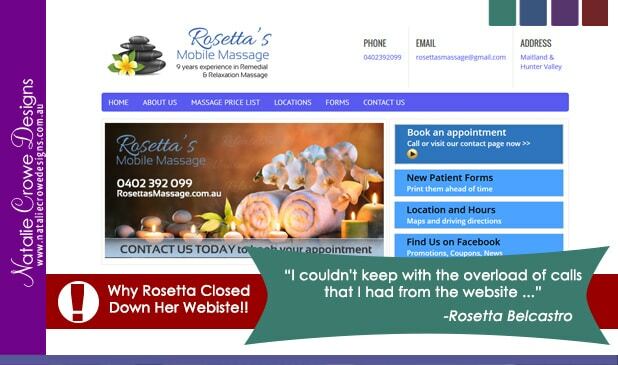 The website was released out onto the internet and things got interesting… Whilst I can tell you Rosetta’s Story, Let’s let Rosetta share her experience..
“I was getting calls weekly about 5 a week due to the new website and people wanting group massages at local resorts at the Hunter Valley. As my business progressed at Kurri Bootcamp I couldn’t keep with the overload of calls that I had from the website and people were telling me that I needed to slow down, so much so that I decided to stop the website altogether, but I would recommend Natalie Crowe Designs to anyone that is just starting their own business. Natalie was helpful and supportive, she answered all my questions and was online and there when I needed her. ” – Rosetta Belcastro. Whilst Rosetta’s website is scheduled for closure in November 2017. Rosetta is still very much open for business and is going strong. Her active facebook page 2327 Remedial Massage is evergreen and growing daily. Rosetta is still operating from the Kurri Bootcamp site on the Main Street in Kurri and has a great local client base here in the Hunter Valley. NOTE: prices are subject to change without notice, at the time of this blog post the information below was accurate. and is great for those who have had a hard working week or feel like treating themselves to some TLC. I will assess which muscles are causing you pain and tailor a treatment plan to suit along with some stretching exercises. Reflexology is a science based on the principle that there are reflex areas in the feet and is known for its ability to quickly relieve stress, harmonise the body and increase immunity.